To those new in this blog, This is my personal finance journal where I track my monthly spending. 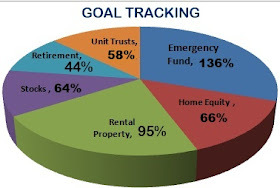 My goal for 2013 is to spend 60% and invest 40% of our income in order for me (and hubby) to retire comfortably in our early 40s. Do you remember how we lived on 38% of our income in January and thought it cant possibly get any better? It did. Its an artificial jump due to the income I received for my tiny online business. 17% This is nicely toned down. I love it. 25% wouldn't be bad. Personal Income 72% 82% This is a new category. Interest/ Dividends 1% 1% Our emergency fund has been reduced. Interest will be low. But we expect dividends to fill the gap..
Online Income 14% 0.3% I will get three months worth this month. I received a fat cheque and deposited it in January.It takes about 6 weeks to be cleared, I was told. Real Estate 7% 13% Wish this would stay his low a contribution to total income. Transportation 1% 1% We live closer to Mr's work and I hardly ever drive. Credit Card, Cash & Fees 4% 6% We used the Mr's credit card and paid it off over 50 days spread. Giving 2% 10% This should be at around 10-12%. It will even out during the scholarship payment months. Net Income (Left to Invest) 80% 62% We paid most of it to our homeloan and some to top my stocks. Our debt-free days are fast approaching. I no longer top my Just Invest (Nedbank) interest up. We lived on 20% of our income in February (comparing to 38% in January). Our Net Worth grew so so well again. This growth is from various sources. The unit trusts did quite well and so did the general JSE. I wish we would do this well throughout the year to be sure to hit our goal of R1M net worth growth by year end. MAIN GOAL: net worth growth by at least 25%.-- 7% so far. BUDGETING: invest at least 40% of income.-- 71% so far. GIVING: give of more than 10% of income.--6% so far. EXTRA INCOME: Online income to R8000 per month by December 2013.-- +/-R3500 January.